Confined space rescue is a vital component of Premium Plant Services’ commitment to worker and job site safety. Should a rescue scenario occur, our employees are trained and ready to respond. 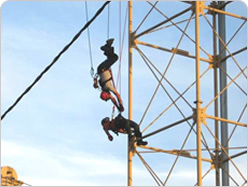 Our staff members received extensive rescue training with recognized safety experts Roco Rescue. This intense week of classroom and hands-on training readies us to meet relevant standards and regulations such as NFPA 1670 and OSHA 1910.46. Premium’s commitment to safety doesn’t stop there. Additional in-house offerings, work-site training and training with community rescue professionals prepare our employees for immediate emergency recognition and response. We also know that prevention is the best method to prevent work-site emergencies. That’s why we exercise vigilance in work-site safety procedures such as fall protection, atmospheric monitoring, PPE diligence, and housekeeping.